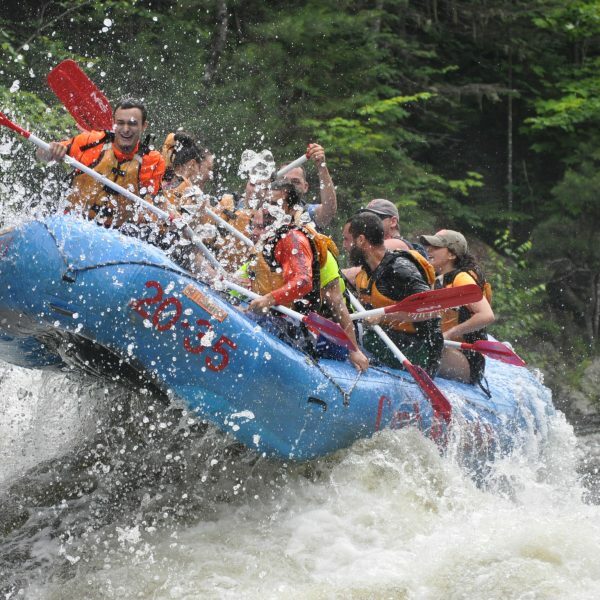 Note: Kennebec River rafting prices do not include $5pp state and river access fees. 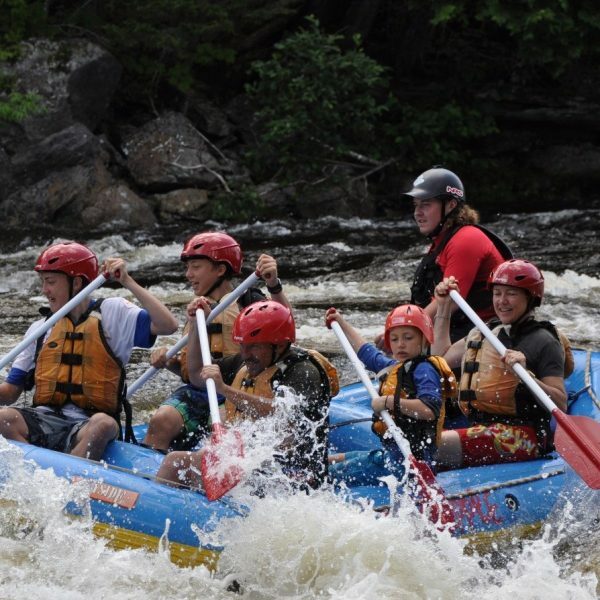 After a short ride (shortest of all outfitters), the Kennebec River white water rafting adventure begins at Harris Station Dam and immediately enters a narrow gorge, hundreds of feet deep.  Quickly picking up speed, rafts plunge through huge rolling waves and heart-pounding drops run expertly by our professional guides. Legendary Class III and IV rapids such as “Big Mama” and “Magic Falls” await you at every turn for over 7 miles. The second part of the Kennebec River trip includes smaller rapids and opportunities to get out and float next to the raft. Water temperatures will top out in the mid-70’s in the summer making this fun for everyone. Our Kennebec rafting trip ends where it began, right back at our base—no cold, soggy shuttle ride (like all other outfitters) back to Crab Apple! Walk out of your raft and into a hot shower in your room, hot tub or our swimming pool while your guides prepare a delicious cookout. 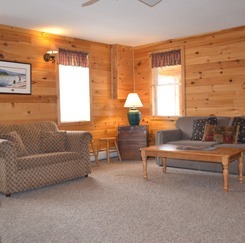 After lunch we head to our comfortable conference room to view photos and video from your day on the Kennebec. 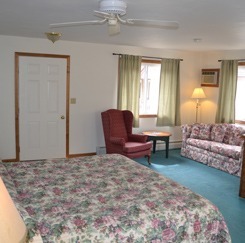 After whitewater rafting on the Kennebec River, many of our guests stay over for a second night and enjoy relaxing time in our pool, take a walk into Maine’s highest waterfall, Moxie Falls, or join the Nightfall Paintball game that begins every day after rafting. Schedule: The Kennebec River rafting trip runs nearly every day from mid April through early October thanks to daily dam releases. Four days this summer Harris Station dam on the Kennebec will run at full throttle – over 8000cfs!. The action is fast and the waves are huge – the wave called “Big Mama” climbs to twenty feet! These four dates will be summer highlights. 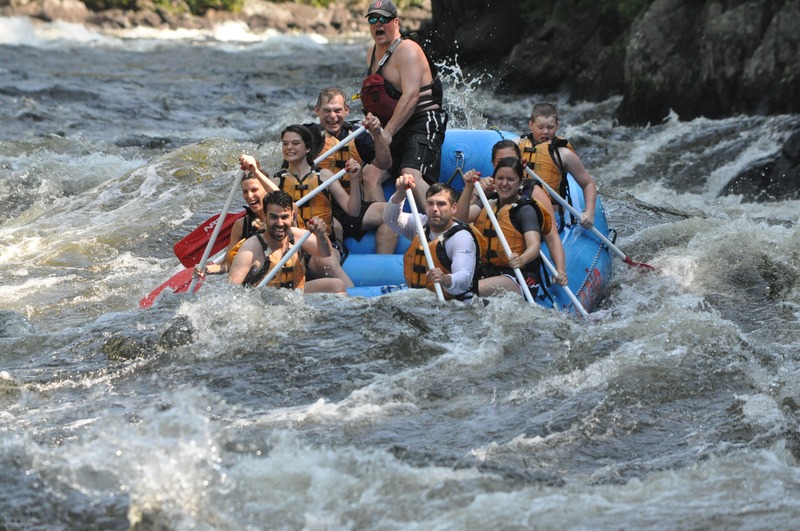 Our 13 foot, 6 person Go For It rafts are the shortest allowed by the state of Maine. 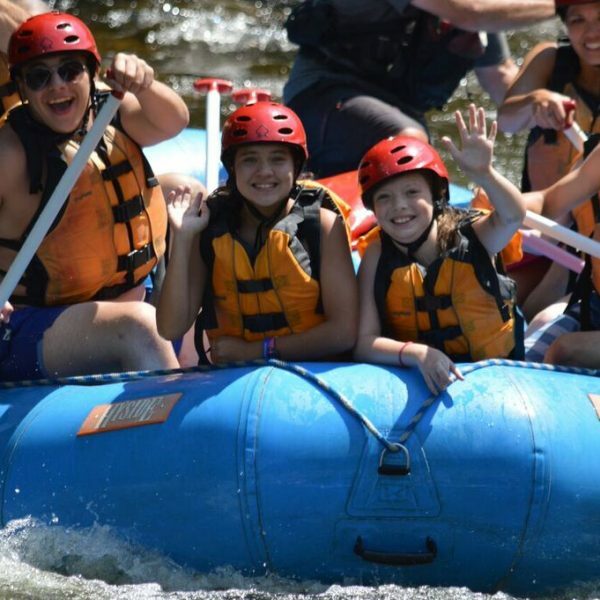 These rafts give the Kennebec and Dead Rivers a whole new look – waves and holes like “Big Mama” and “Magic Falls” swallow these smaller boats making for some of the wildest rides of the season. 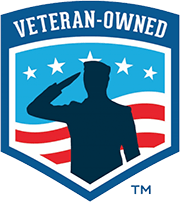 This trip is geared toward veteran rafters and a minimum of 4 people is required to run a Go For It trip. Trip dates: Daily on Kennebec River starting May 14 (except Generator Check dates 6/15, 7/18, 9/7, 9/21). Available on Dead River May 26, September 1 and October 5. The River Cottage sits right on the Kennebec River. Loads of space with 4 bedrooms, 2 baths and living room. The River Cottage is great for large groups of friends or family who want to hang out and enjoy each other’s company but also have just a short walk across the street for breakfast before the trip and the pub after rafting. 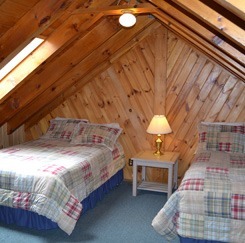 Sleeps 6-12. Air conditioned. The Snow Cottage was designed with flexibility and convenience in mind for rafters. 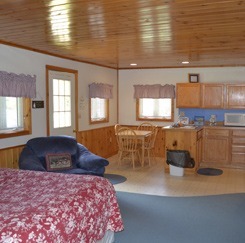 It is complete with kitchenette, full bath, Satellite TV, bedroom and living room. 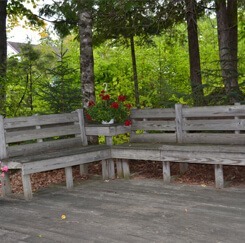 The cottage also gives you privacy as it is set away from other accommodations. Air conditioned. 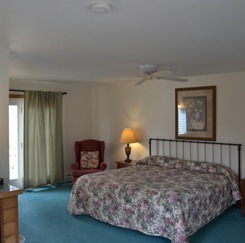 Our four Queen suites are beautiful! 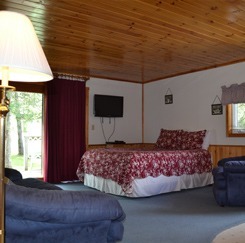 Each includes two queen beds, wet bar, mini fridge, two person whirlpool jacuzzi tub and deck. 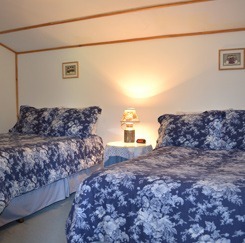 Each room is unique and comfortable. Air conditioned. 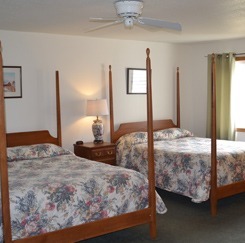 Our four King suites are so comfortable! 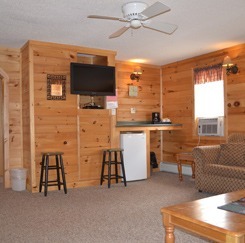 Each includes a King bed, wet bar, mini fridge, two person whirlpool jacuzzi tub and deck. All four are different and relaxing. Air conditioned. 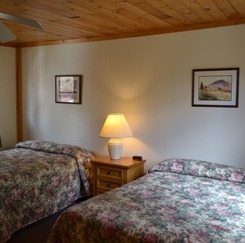 Larger unit within The Lodge sleeps 4-8 people. 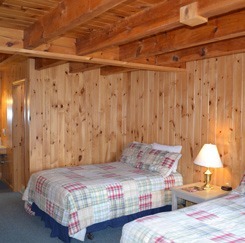 Rooms have the feel of Maine’s wilderness with natural wood interiors and a view of the Kennebec River. 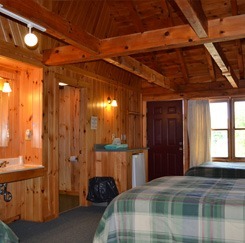 Adjacent to the swimming pool and outdoor hot tub. Air conditioned. Open floor plan well-suited for groups of friends or family. 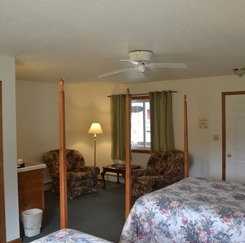 Conveniently located adjacent to the pool and hot tub. Air conditioned. 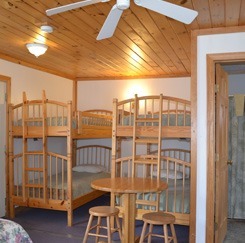 Unit within The Lodge for 4-8 people. 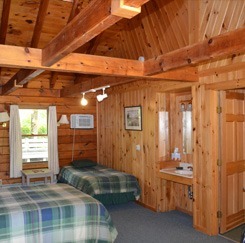 Natural wood interiors and a view of the Kennebec River. 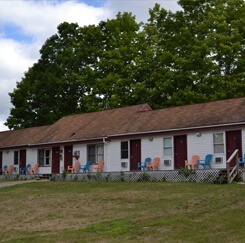 Adjacent to the swimming pool and outdoor hot tub. Air conditioned. 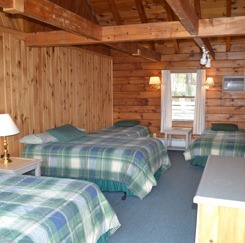 The Lodge has six private guest rooms. 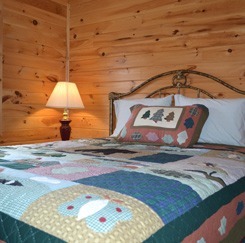 Five Guest Rooms have two double beds, private bath and front deck. 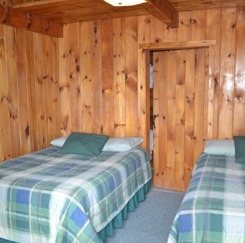 One room has a double bed and a set of bunks. 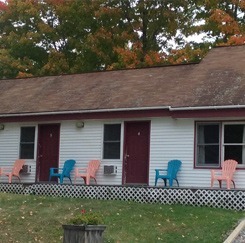 Adjacent to the swimming pool and outdoor hot tub. Air conditioned. 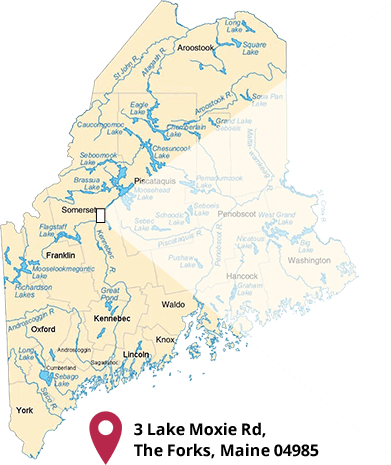 Why Choose Crab Apple For Maine White Water Rafting? You are going to have a blast rafting in Maine, but you are also going to be exhausted when it is over. 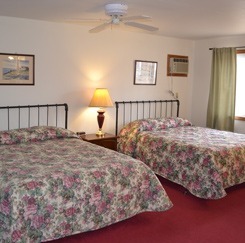 Our Maine rafting participants usually opt to stay overnight at our comfortable lodging facilities. 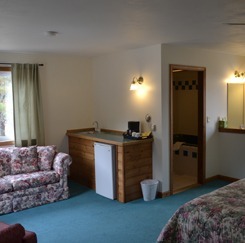 We have sleeping options ranging from Jacuzzi suites to cozy cabins and our base lodge features a comfortable gathering area and a delicious pub and restaurant. We even offer guided moose safaris and paintball battles to complement your Maine white water rafting trip. Safety has been our #1 priority since 1983. Our Safety Record is unmatched – we have carried over 500,000 passengers and never had a major accident or fatality. We are very proud of our safety record. Personal Comfort – Our stock of over 400 wetsuits and lifejackets are continuously upgraded and come in a vast array of sizes to fit you comfortably and keep you safe. We have over 100 rafts and inflatable kayaks of different sizes to ensure the best experience on the river. 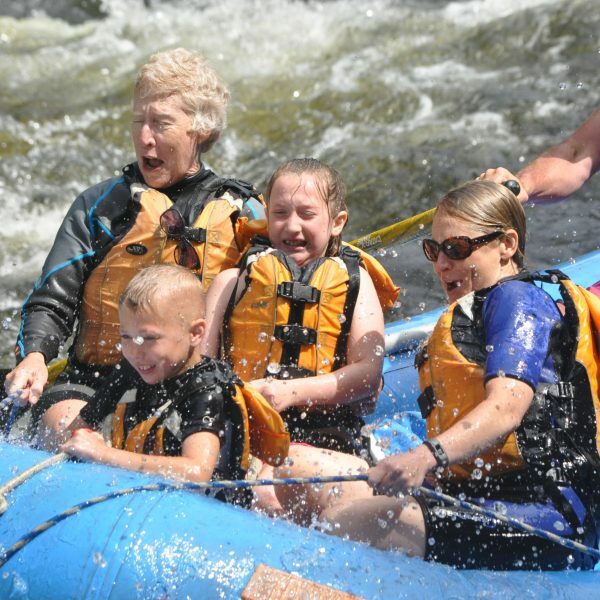 While we are an extremely popular tourist attraction, we love taking our neighbors white water rafting in Maine. 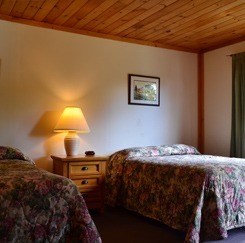 We offer special rates for those living in Maine, saving you up to $40 on a trip!